I’ll be on Evening magazine Friday, November 4th talking about the clocks in Seattle, in honor of the end of Daylight Savings Time (which ends early Sunday November 6th). A producer stumbled on my Seattle Clock Walk site and asked me to say a few words on camera. This is a perfect opportunity for me to save a few short pieces I wrote for the zombie website Seattlest at the start of summer time in 2011. They deserve to see some daylight. Georgetown clock in 1910 from the Seattle Municipal Archives mixed with 2010. Back before the days of cell phones or even quartz timing, public clocks were the closest thing to official time. And ever since Daylight Savings Time hit the scene, any clock still behind an hour has been ridiculed, scorned, and generally laughed at. DST – or summer time as it’s known on the street – was given trial runs during both World War One and World War Two. In both instances the President enacted it and it was later repealed by Congress in peace time. Our current system was put in place piecemeal over the years and finally standardized in 1966. Of course, it’s gradually lengthened over the years. The end of summer time is great, because you get an extra hour of sleep. The start of it is universally detested for losing that hour. This year, why don’t you try taking out your anger an an inanimate object? Point your finger and laugh out loud at any clock you find which is off by an hour. Somebody who apparently didn’t care about whether frugal persons saved daylight or not, or who took a look at the murky atmosphere of yesterday and decided there was no daylight to save, anyhow, forgot to change the time on the old city hall at Georgetown. And all day long the official timepiece rattled its way through the day an hour behind the rest of the American procession. Inspired autoists who burned up distance between Tacoma and Seattle jogged into Georgetown before they left Pacific Avenue in Tacoma, if the Georgetown official clock was to be believed. And sad-eyed farmers who got up in the early morning fog to bring in the family milk found that Georgetown was entitled to an extra hour in bed and in no haste for the morning’s breakfast. 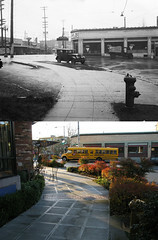 The Sender clock is seen in a 1953 Seattle Municipal Archives photo, mixed into 2010. You’ve lost an hour. We’ve lost a clock. Don’t miss your time. Daylight Savings Time is here. Maybe you slept through church on Sunday. Maybe you didn’t realize it until you missed your first class or a meeting at work on Monday. No matter what, you feel jet lagged despite lacking the thrill of a vacation or relief of a completed business trip. Hopefully you’re venting on inanimate objects like we suggested last week. Just find a clock that’s an hour off, point, and laugh out loud. It works better if you laugh until someone picks up the phone to call for help. You won’t be able to laugh at our old clock here, though. This is its final resting place (in Seattle) in 1953, on Pike just across from the market. It made its way around the block, though. [check if true] You can see it on Second in 1914, before the knucklehead owner covered its fun watch shape with a sign. That same knucklehead sold it to a collector in California, and now it’s in someone’s back yard down there. So it’s a simple reminder. Time is ever moving. Things will not remain the way that you know them. Enjoy what you have while you have it, and who you know while you know them. If you get a call for help today, here’s hoping that you hear laughter in the background. Here are additional details, a 2016 update to the story. The street clock is indexed in the Seattle Clock DB under the name “Wolfe”. The DB has links to a number of historic photographs of the clock. Theo or Theodore Wolfe purchased this clock from E. Howard & Co in Massachusetts in 1909. It was first located a block east of here at 219 Pike Street. (William) W. B. Clifton bought the store and clock in 1913. In 1923 Clifton moved here to 108 Pike. R. L. Cole took over the store in 1947, and James Sender took over in 1953. Sender sold the clock to California collector Leo Severns in 1961. Severns donated it to Chapman University in 1992. Chapman surplused it after a campus landscaping change in 2008 and sold it to Mike Vogelvang.